Other animated features include some with children and realistic animals, or which have brief sequences with fantasy animals, such as Zarafa, about a small African boy who follows his pet baby giraffe who is sent to Europe as a gift for King Charles X of France (loosely based on a true incident; French with English subtitles; March 9 at SVA and 24 at the DGA Theater); Starry Starry Night, live-action about Mei, a dreamy schoolgirl who imagines animated animal friends, some in animated origami (Mandarin with English subtitles; March 2 at the Scholastic Theater); a new Italian Pinocchio closer to Collodi’s original story than Disney’s (in English; March 10 at FIAF); Hey Krishna, about the Hindi god Krishna’s youth, with brief appearances of anthropomorphic monsters and demons (in English; March 16 at FSLC and March 17 at the IFC Center); and The Painting, starring figures from both finished and unfinished paintings (premiere of the English dub; March 2 and 23 at the Scholastic Theater). Still others have no anthropomorphic aspects but will be of interest to animation fans, including Studio Ghibli’s From Up on Poppy Hill (in English; March 2 at SVA and March 10 at FIAF); and Kirikou and the Men and the Women (French with English subtitles; March 9 and 24 at the IFC Center). Or if you want to see the Spanish dub of Disney’s Wreck-It Ralph, here it is (March 16 at SVA). 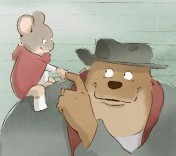 Tickets are for sale on gkids.com. Screenings are expected to sell out, so advance online purchase is recommended. Children's festivals need creepy adults! Let's grace them with our presence! The 16th Annual New York International Children’s Film Festival, February 28th through March 24th, has added two additional screenings of the Japanese “The Wolf Children” (“Ame and Yuki, the Wolf Children”), in Japanese with English subtitles. The original announced screenings are March 3rd and 16th; the additional screenings are on March 9th at 4:00 and 6:30 p.m. at the SVA theater. There will be Q&A sessions at both screenings with Director Mamoru Hosoda. “Due to overwhelming demand”, the Festival has added four more screenings of Studio Ghibli’s new “From Up on Poppy Hill”, in English. The two announced screenings are on March 2nd & 10th; the new screenings are all on Saturday, March 16th – 11:10 a.m. & 1:00 p.m. at the IFC Center, and 11:00 a.m. & 1:10 p.m. at the Elinor Bunim Munroe Film Center. “Poppy Hill” is absolutely non-anthropomorphic, but it is a new animated feature from Studio Ghibli.